IRELAND will experience the biggest drop in economic growth experienced by any industrialised country since the Great Depression of the 1920s. This was the shocking forecast by the Economic and Social Research Institute (ESRI) in a report published on Wednesday. Meanwhile the Central Statistics Office says unemployment in the 26 Counties has risen to 11.4% following another jump in the Live Register figures over the past month. More than 384,000 people were signing on during April, an increase of 13,000 on the figure for March. The latest rise means the total number of people on the Live Register has increased by almost 97% over the past year. The quarterly economic report by the ESRI predicts that gross national product will fall by 9.2 per cent this year. “Our forecasts suggest that Ireland’s economy will contract by around 14 per cent over the three years 2008 to 2010. By historic and international standards this is a truly dramatic development. “Prior to this the largest decline for an industrialised country since the 1930s had been in Finland, where real gross domestic product declined by 11 per cent between 1990 and 1993”, the report said. The ESRI expects the average number of jobs in the economy to fall by 187,300 this year and the number of people unemployed to rise to 292,200, giving an average unemployment rate of 13.2 per cent. The report predicts another 102,800 jobs to be lost next year, and for the unemployment rate to average 16.8 per cent. Dr Alan Barrett, one of the report’s authors, said the severe recession was a result of the 26 County economy being very exposed in an international downturn while at the same time having allowed housing and construction generally to have become too large a part of its domestic economy. The ESRI believes there may be net annual emigration of approximately 30,000 in the years to April 2009 and April 2010. It expects a general Government deficit of 12 per cent of gross domestic product (GDP) this year, and 11.5 per cent next year. Government debt is expected to be more than 55 per cent of GDP by next year. The ESRI forecasts do not take into account the cost to the state of buying toxic assets from the banks by way of the National Asset Management Agency (NAMA). This will add a huge amount to Government debt and to the state’s annual interest bill. “This mornings live register figures and the ESRI report that the economy will contract by 14% over three years is concrete evidence of the Government’s failed economic policy. 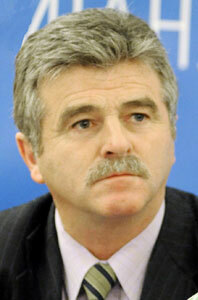 “Ireland is facing a tsunami of unemployment. This morning’s CSO live register figures show that another 15,800 joined the live register between March and April to reach 388,600 in April. “The ESRI predicts that another 102,000 jobs will be lost by the end of next year. “While the ESRI stated the Goverment’s recent budget had a positive effect in restoring fiscal stability, the forecast by the ESRI of a. 11.5% defecit in spending did not take into account the cost to the state of purchasing toxic assets through NAMA. “Sinn Féin opposes making the taxpayer liable for the reckless behaviour of lenders and property speculators. “The Government is ignoring the unemployment crisis. Unless there is a shift away from bailing out the banks to saving jobs and creating employment, Ireland will suffer the worst economic depression in modern history. “The Government must use its resources to fund employment in the private sector. Sinn Féin will continue to call for a €300 million job retention fund.